However, since ashes from one burning tend to last for many years, most parishes no longer make new ashes every year. Old branches, being blessed objects, should not be put into the garbage. The best way to dispose of them is to burn them and put the ashes into the ground. 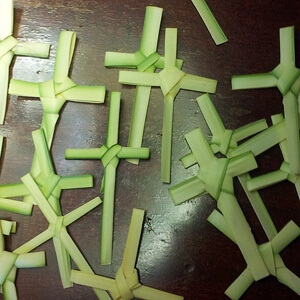 As to making the branches into crosses, this is a long honored tradition in many places, and a beautiful way to commemorate Holy Week and Easter.